Here’s a great technique that helps in determining project feature priority. Agile/Scrum manifesto is based on the premise of working on the high value items first. These may be the features that bring the highest ROI, a matrix of complexity / risk vs. value, market value, etc. Whatever the determining factor is, the prioritization of these value features is important in order to ensure that those value items are delivered first. Story mapping is a process of defining the features/functions that you want your project to accomplish and organizing them in a way that makes the most sense (by process, menu option, user role, etc). This provides the team, with a “big picture” view of the project as a whole. We use this in conjunction with our “Product Backlog” (Agile/Scrum requirements list), prioritized list of user stories (requirements / features) for the team to implement. This works well for our Sprint Planning, but doesn’t show a big picture view of the project. This big picture view project helps in the definition, organization and prioritization of user stories (requirements / features). It provokes communication and provides a clear path to the high value user stories. Write down all the features you would like to have as a result of the project on to sticky notes (one on each). With the help of a facilitator, classify each into groups (by process, menu option, user role, or etc.) that make the most sense. Take different color sticky notes and write the group name for each (one on each). Then arrange all of the features, underneath each group note, sticking them on the wall in rows/columns as the logical arrangement naturally occur. 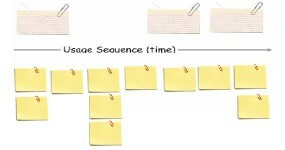 Feature sticky notes can be moved around, as the team makes sense of the emerging flow. Once complete, the Story Map gives a high-level view of all features and allows the team to make better decision about the high value feature sets. The set of high value features becomes the “Minimum Marketable Feature Set”, the set of feature that most be implemented to make this project successful. Now you know where to start! The Story Map then becomes a boundary object, providing a mechanism where different points of view converge and enables a shared understanding to be formed. But most of all it helps in defining, reinforcing and communicating the project vision.